It’s no secret that I’m a fan of Khong Ten and it’s bold and daring ‘New Vietnamese’ hybrid cuisine. It’s a great spot for dinner and drinks but it’s also a must-visit for lunch and especially weekend brunch where báhn mi sandwiches and day drinking make for a great time. 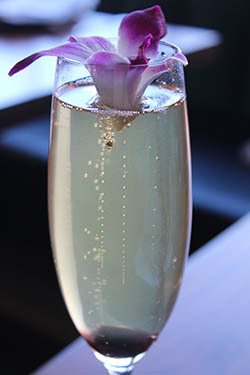 The brunch menu is filled with plenty of great day drinking options, including, several mimosas to choose from and clever concoctions like the Kim Chi Bloody Mary, the Vietnamese Michelada, and the Hotlanta Sangria. And while tasty brunch options are aplenty, let’s start with the báhn mi—a house specialty. The popular Vietnamese sandwich consists of a Vietnamese single-serving baguette, also called bánh mì, which is split lengthwise and filled with various savory ingredients. A typical sandwich is a fusion of meats and vegetables, including pork sausage, coriander leaf (cilantro), cucumber, pickled carrots, cabbage, and daikon combined with condiments from French cuisine such as pâté, along with jalapeño and mayonnaise. In Vietnam, these sandwiches are typically eaten for breakfast or as a snack; they are considered too dry for lunch or dinner. My favorite of the Khong Ten báhn mi sandwiches is the Breakfast, which is prepared with 5-spice peads and Barnetts Bacon, sunny side up eggs, pickled carrots and daikon, hoisin, cilantro and Fresno chili. It’s a wonderfully tasty breakfast treat. Another solid sandwich is the Burger, made with Vietnamese seasoned chuck and sirloin, roasted Tutti Frutti Farm tomato, caramelized onions, cilantro and herb mix, and Fresno chili. It’s a delicious Vietnamese burger if you will. It’s hearty and an absolute hero of a sandwich. Not to be outdone, the House Made Charcuterie bánh mi as the most similar to the classic sandwich. It’s made with chicken pâté, Vietnamese mortadella, Peads and Barnetts headcheese, pickled carrots and daikon, cucumber, cilantro, and Fresno chili. The pâté offers that familiar bánh mi taste that I love so much. There’s also a Vegan option, prepared with turmeric dill tofu, shitake, pickled carrots and daikon, cucumber, Coleman Farm cilantro and dill and wild herbs, and Fresno chili. This is a satisfying sandwich for non-meat eaters. Weekday lunch also includes the Hanoi Black Pepper Chicken made with Mary’s Organic Chicken, pickled carrots and daikon, cucumber, Coleman Farm cilantro and dill and wild herbs, and Fresno Chili. A boozy bánh mi brunch here is a delectable treat. Order several sandwiches and eat them family style and you won’t be disappointed. 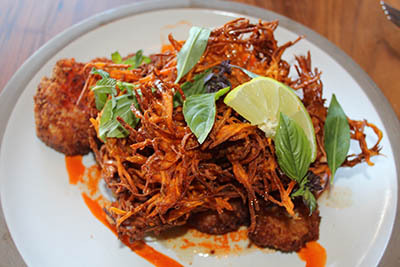 Other wonderful brunch options include the K10 Chicken & Waffles prepared with Thao Farm sweet potato spider waffle, Saigon cinnamon organic chicken, 5 Spice palm sugar syrup, and house hot sauce. 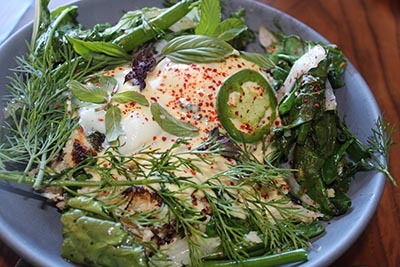 It’s a great take on a brunch staple and offers a bold yet unique flavor. Another favorite of the reimagined classics is the Crab Benedict with sautéed Thao Farm greens and scallions and dill as well as “Mother” hollandaise. This is an absolutely lovely version of a popular dish. 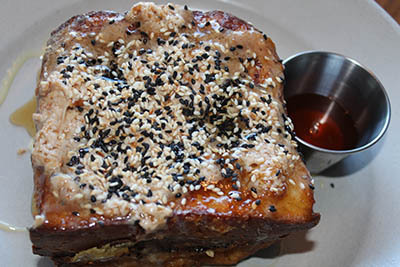 And last but not least, the Tamarind French Toast with Drago brioche pan de mie, tamarind butter, toasted sesame, 5 Spice palm sugar syrup, and almonds is a flavorful variation on French toast. This West L.A. ‘New Vietnamese’ gem offers a relaxed setting that welcomes a long, lazy brunch of drinks, bánh mis and reimagined brunch favorites. Take your time, indulge, and enjoy and great time of fare and fusion. 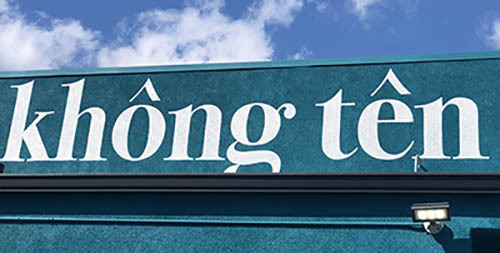 Không Tên is located at 11520 West Pico Blvd. Open Tuesday through Sunday from 11am to midnight with happy hour from 3pm to 6pm and late-night drink specials starting at 10pm. Call 424-832-7000.